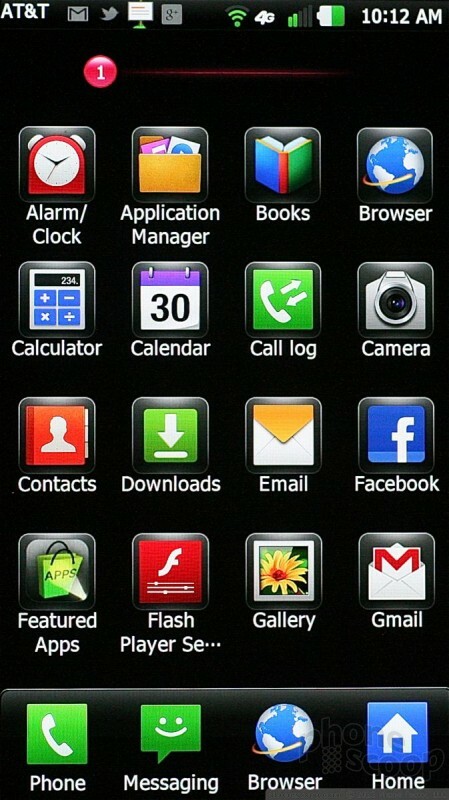 The Nitro HD runs Android 2.3.5 Gingerbread with some light tweaks to the appearance of the icons and menus thanks to LG. 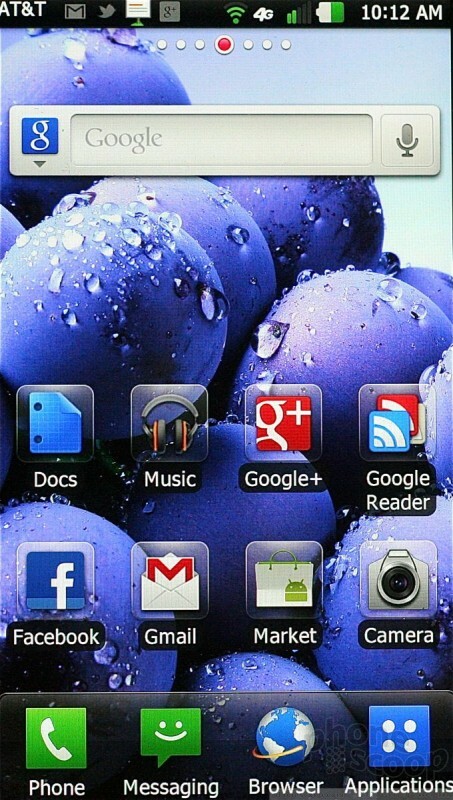 There's no official word from LG or AT&T yet on whether or not it will be updated to Android 4.0. 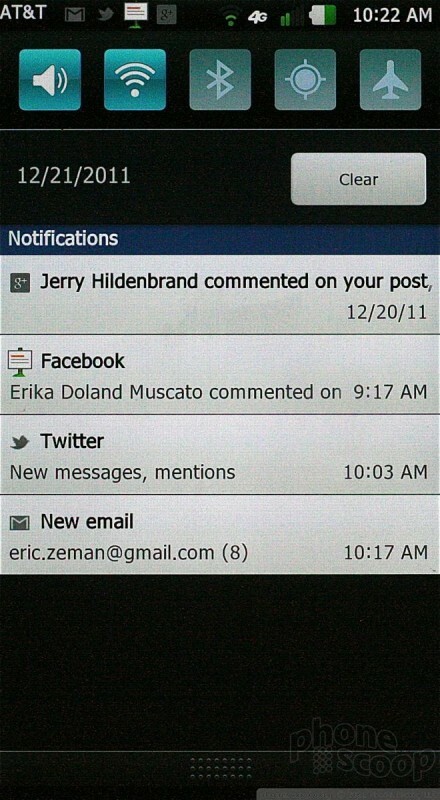 It offers seven home screens for personalization, and the dock at the bottom of the screen has four items in it (phone, messaging, browser, apps). You can switch these out for something else if you want to, but it's a headache to do so. LG has its own tool for customizing the home screen with widgets and shortcuts, etc. It slides up from the bottom of the screen and give you a small selection of widgets, etc., in grid form to choose from. You can easily parse between widgets, apps, shortcuts, and folders using this tool thanks to some sorting buttons at the bottom. The default main menu is laid out in a vertical grid, which can be separated into different views, such as the most recent apps used, downloaded apps, all, etc. The main menu can be viewed in page form (with pages arranges horizontally) or standard vertical list form. There's also a search bar in the main menu in case you want to search for the app rather than scroll for it. The notification shade hasn't been customized in any truly unique way, but it does provide controls to toggle on/off the cellular, Wi-Fi, Bluetooth, and GPS radios, as well as the sound. The Nitro HD has a dual-core 1.5GHz Snapdragon S3 processor, which might fool you into believing that it's the fastest smartphone out there. Sadly, you'd be wrong. It lags a lot, all over the place. It's not a severe lag, but any lag is annoying. The Nitro HD pauses between screen transitions, jumping between apps, and so on. It's not severe, but it's a shame because the lag is noticeable throughout the phone, and really drags down the overall experience.